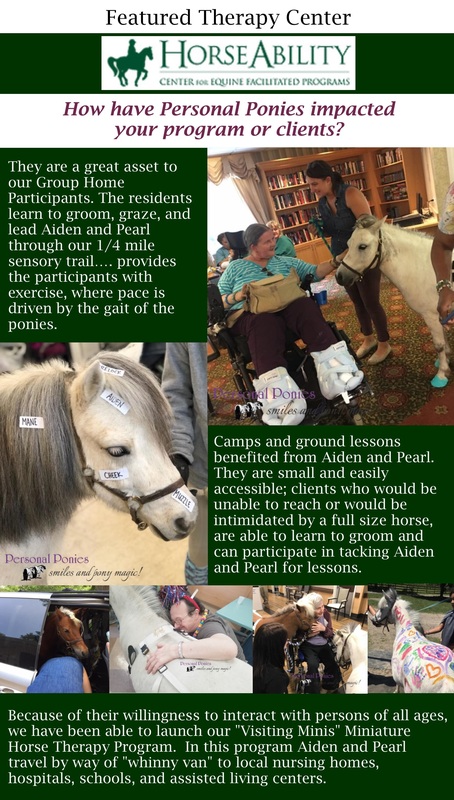 Learn about our progressive Therapy Center partners that bring our special ponies to families, children, seniors, veterans- anyone, who can benefit from an "eye level" Personal connection. 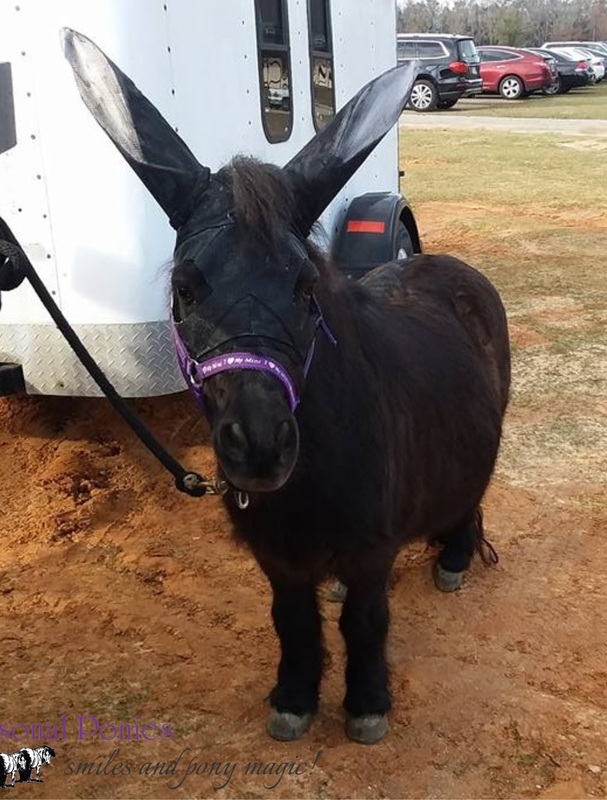 Faith Equestrian Therapeutic Center​ in Guyton, GA is one of our amazing PATH partners. Our UK Shetland Ponies, Higbae and Jazzy are utilized in their Equine Facilitated Learning Program and other very popular community events. Faith Equestrian Therapeutic offers two primary programs: the Therapeutic Riding program and the Equine Facilitated Learning Program. They also take riders to the Special Olympics Georgia in Gainesville every year. In the summer, they offer typical camps and camps for individuals with special needs, which helps them to support their regular program. Hallie Myers​, Program Director and Bonnie Rachael​, Director at Faith Equestrian share how Personal Ponies​ contribute to their programs differently than horses. HorseAbility is in Westbury, NY. 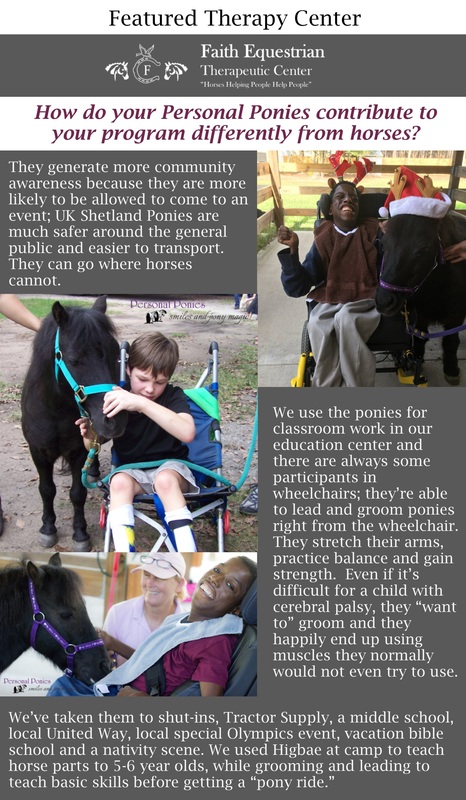 Their mission is to improve the lives of individuals with special needs through facilitated interactions with horses. Personal Ponies Aiden and Pearl are heavily and gleefully utilized in their wide range of horse-related programs that promote the physical, psychological, emotional, social, and spiritual well-being of its participants. They even have their own Facebook page and personalized transportation, the Whinny Van!! Here’s how HorseAbility feels Aiden and Pearl have impacted their program.